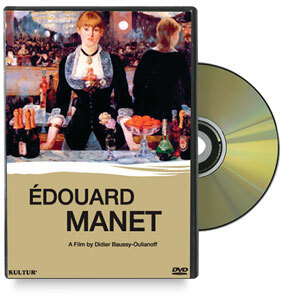 Have you ever wondered how to paint like Monet or wanted to paint like he does? When you see his works, like the huge water lily paintings in the Orangerie Museum in Paris, you know that he was truly a master colorist. Those paintings made such an impression on me that to this day I'm still inspired to follow in his footsteps. I want to venture outdoors, see the natural world around me, and paint it the way that he did. It is an invigorating change from the studio painting approach I normally use. Learning how to paint like Monet is easy. There are three aspects to keep in mind: how he mixed his colors, his technique of applying the paint, and his process for creating paintings. First–How to paint like Monet? Learn what's on his color palette. Monet started out as a tonalist. He later chose the impressionist approach because he wanted to study the effects of light on the objects around him. Lead white, chrome yellow, cadmium yellow, viridian green, emerald green, French ultramarine, cobalt blue, madder red, and vermilion. You will see some ivory black in his paintings before 1886, but he abandoned it for his later work and used more vibrant colors to mix his grays. Be aware that lead white is toxic, so use titanium white as a safe alternative. You can also replace chrome yellow with cadmium yellow light, and use alizarin crimson instead of madder red. Whatever you do, make sure you have two intense yellows and reds, a vibrant blue, and a green. Once you are familiar with a limited palette, you can gradually add to it. For pastel artists, try Sennelier plein air color choices. Many colors have been developed since Monet's time. You should definitely experiment with them (it's fun!) but only after you are proficient with a limited palette. You can start with as few as three colors plus white as a reduced palette. Monet did this by, for example, putting a stroke of pure red right next to a stroke of pure yellow. Side by side, the two spots of color produce a rich and vibrant orange. He also laid in large masses of vibrant color first. Then he would apply strokes of pure colors over them to enrich the original color masses. As an example, see the chart below for mixing orange. The first spot on the far left is orange color straight from the tube. The second is a juxtaposition of pure yellow and pure red side by side. The middle spot uses the same yellow laid on top of a wet spot of red. The fourth is the result of yellow mixed into red using a wet into dry technique (scumbling—painting opaque or semi-opaque colors over dried darker colors). It is almost the same as the third, but more vibrant. The last patch on the far right is the result of directly mixing the red and yellow paint. You can see that the second, the fourth and the fifth spots are more vibrant and interesting. The colors are not only mixed but seem to vibrate. Monet mixed his colors using either a wet into wet technique or scumbling (wet color spots on dried layers). Monet would mix a series of secondary colors on the palette, and placed them side by side or, dabbed them all over keeping the color spots separate. How to paint like Monet's- the process. Although he painted outdoors, Monet did not finish paintings in one session. In fact, many of the canvases were so large he had to hire an assistant to haul them in and out. He said that he brought many canvases outdoors and worked on each one for a short time at the same time of day over several days. You can imagine how he had very little time to work on a painting each day before the “moment” was gone and he moved on to the next. This approach allowed the paintings to dry a day or two between sessions, which makes scumbling easier. So if you want to learn how to paint like Monet, keep in mind that you don't have to finish everything in one session. 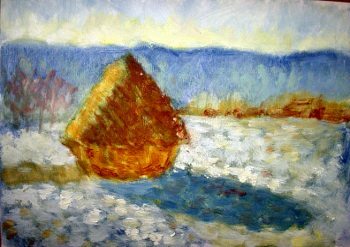 To demonstrate all of this, why don't we take a painting of Monet's, the “Haystack in Winter,” and recreate it? 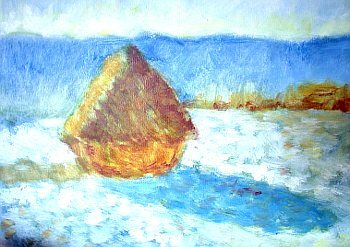 “Haystack in Winter” is a charming, simple, and unmistakably Monet painting because of both the subject matter and the brushstrokes. No complicated drawing is needed, which makes it perfect for this demo. 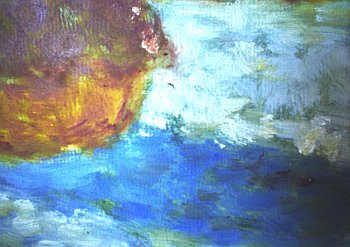 First, I draw the large shapes with a brush, and then cover the large masses to create an underpainting on the white canvas. (I am partial to toning canvases for oil painting, but this is the exception). I use slightly diluted paint (diluted with some water since I use water soluble oil paints). 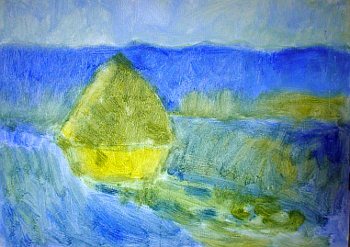 I use a blue tone for the mountain in the background, and a warm green and yellow in the foreground and on the haystack. I mix some white into the sky to match the value in Monet's original painting. I then let the layer dry completely. Once the first layer is dried, I begin to scumble colors all over. Starting from the top, I scumble pale yellow into the lower sky. I mix a pale grayed green into the lower part of the mountain. I scumble blue into the cast shadow of the haystack. I mix a brown using orange, yellow, and burnt sienna with a bit of blue for the hay stack and the village on the right. I also dab the same warm brown in the foreground. In the next step, I dry brush the white colors into the ground. I tone the white down with a tiny amount of yellow or blue. I do not want to use the starchy white paint directly from the tube, because it attracts too much attention. Even when Monet was painting the most vibrant colors, he was still very deliberate in maintaining harmony of color and value. Here is a close up of the broken color dabs that I used. Notice that I let the underpainting show through. The white paints are thick impasto passages. I then modify the sky and the mountain by adding more dabs of grayed green and yellow. I continue to scumble white paints over the ground. I keep the dabs separate as much as possible. I continue using the same scumbling technique to dab more colors onto the canvas. I keep the overall value relationships correct by squinting. Every time I find that I have misjudged the value of a color, I modify it. Even if the colors are interesting and vibrant, they still need to be tied together to make a united whole. I begin to zero in on small masses and details. I mix some grayed red color for the trees on the middle left. 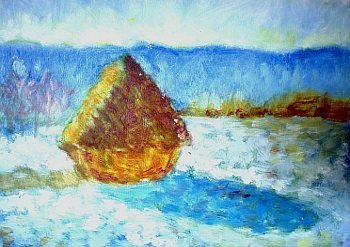 Almost done....I see in Monet's original painting that the haystack's shadow has violet colors on top. I could have added that color immediately, but I am afraid that it might make the shadow look muddy and heavy. So I wait until the whole painting is dry and then I scumble that color over it for an airy and light effect. 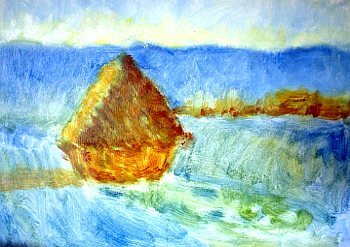 The original haystack painting's size is 25¾ x 36 3/8 inches (65.4 x 92.3 cm). Monet painted it outdoors. The demo I did is only 6x8 inches. I could have painted this scene in one session, but with Monet's broken color technique, I have to wait for each layer to dry until it is tacky or semi-dry so that the colors I scumble or dry brush over will not disturb the layer underneath. As a plein aire painter, I know that it is out of question to create a painting the size of Monet's outdoors in one session. It's nice to know that I do not have to make a painting 'right' on the first day; I can rework it over many days until it's finished. If you want to learn how to paint like Monet, it is best to copy his paintings. That will give you a better understanding of how the process works. It will make you appreciate the optical effects achieved through his techniques and his respect for faithfully catching the natural effects of light.